A wedding candle centerpiece is an elegant way to help set the mood while finishing off your wedding reception decorations. Choosing this type of centerpiece allows you to use your creativity while still being practical. Not only do they never seem to go out of style, they can also be easy on your wedding budget. Creating them yourself is also an option if you are a do it yourself bride. There are many websites and stores that sell candles and other items for making your centerpieces. Candles come in all shapes and sizes, and there are many different ways to use them as a wedding candle centerpiece. Listed below are 7 ideas to get you started. Pillars are probably the most common type of candle used in centerpieces. They come in just about any color, and there are a few different sizes as well that you can use. A popular way to use pillars is to place one at the center of your tables with a floral display around them. This is an easy option that can work with just about any type of flowers. For a holiday wedding try putting one at the center of a wreath or alongside harvest items for a fall wedding. Pillar candles can be used alone with flowers or other accent items as mentioned, or you can place three or four of varying heights at the center of your tables as well. Traditional taper candles are classy and can really help with setting the mood. They come in many different colors, and it is usually a good idea to choose the no drip kind to avoid damage to your table linens. Tapers can be used for a more formal, sit down reception, and they can also be used in floral arrangements as well. Candle sticks or candelabras at the center of each table are an elegant touch. A unique twist on a candle centerpiece. Visit floating candle wedding centerpieces for information and ideas. Votives can be a simple, inexpensive part of your centerpieces. Use several in a circle at the center of your tables, or use them along with flowers and other items. Scented votives can help to set the mood and also tie into your seasonal wedding theme. Who doesn't like the smell of gingerbread around the holidays or pumpkin in the fall? A wedding candle centerpiece can help to finish off your overall wedding theme. Use colors that match your wedding colors, or choose unique shapes that accent your theme. 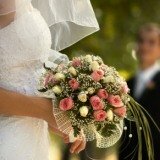 Having a fall wedding? 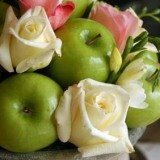 Use apple shaped candles in your flower centerpieces. Or, use votives to light up your jack-o-lanterns. As mentioned earlier, scented candles can also help to set the mood of your seasonal wedding theme. Flowers are always a popular choice for use in wedding centerpieces, but there are many other things that can be used as well. Coffee beans, stones, pearls and crystals are a few of the things that can be used in your centerpieces alongside candles. Place pillars on square or round mirrors for a nice effect, or add other items along with your floating candles. Hurricane vases work great for candle centerpieces. Place a pillar at the center, and fill around them with stones, shells, sand, coffee beans or anything else that accents your wedding decorations. Instead of boring, simple candle sticks, look for ones that are antiques or unique in color or shape. Wine bottles can also be used to hold tapers. For a summer wedding, small lanterns are a cute alternative. Add votives or tea lights to them. Other unique containers include jack-o-lanterns, lighthouses and unique votive holders.